Tom Copeland is the nation’s leading expert on the business of family child care. A renowned tax and child care business specialist and licensed attorney, Tom received his BA from Macalester College, and JD from William Mitchell College of Law. He is the author and coauthor of numerous books including Family Child Care Contracts & Policies, Family Child Care Record-Keeping Guide, Managing Legal Risks in Early Childhood Programs, Family Child Care Marketing Guide, Family Child Care Money Management and Retirement Guide, Family Child Care Business Planning Guide, Family Child Care Legal & Insurance Guide, annual editions of Family Child Care Tax Workbook and Organizer, and Family Child Care Tax Companion, and Family Child Care Inventory Keeper. Each year Tom trains thousands of family child care providers, trainers, and tax preparers on important business issues, including record keeping, taxes, marketing, contracts, and legal issues. Currently, he is a consultant for the National Association for Family Child Care (NAFCC). Tom has received numerous awards for his work including; the Friends of NAFCC Award from the National Association for Family Child Care, and the Care Advocate of the Year award from the Minnesota Licensed Family Child Care Association. He has represented numerous providers in IRS audits and has won three US Tax Court cases. In 2003, the IRS issued Revenue Procedure 2003-22 that allows family child care providers to use a standard meal allowance rate to claim food expenses. Tom was the author of the proposal that led to this rule. Visit our Ask the Expert with Tom Copeland page to see some previously answered Family Child Care Business questions or to ask your own! 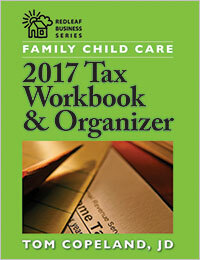 Save time and money at tax season with the most comprehensive family child care resource available. 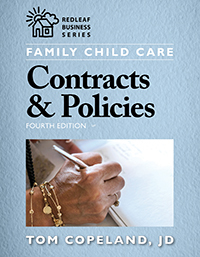 The fourth edition of the business classic Family Child Care Contract & Policies offers the most comprehensive, up-to-date tools for family child care providers to better communicate with parents and reduce conflicts, establish and enforce contracts and policies, and demonstrate provider professionalism. New to this edition is expanded advice on offering part-time and after-hours care, and charging for vacation time. Supplementary online materials include customizable forms and worksheets. 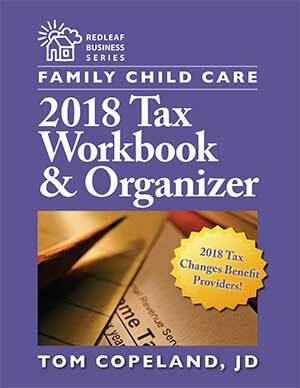 As tax season approaches each year, thousands of family child care providers save time and money using the Tax Workbook and Organizer. The most comprehensive resource available, this book contains up-to-date guidance so you can accurately complete your own tax return and take advantage of all the business deductions you’re entitled to claim. It also includes new tax laws, tips to help you save money, and tools that will take the guesswork out of doing your taxes.